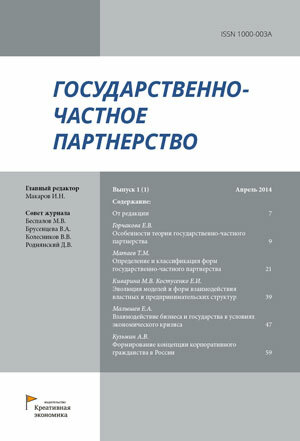 The article studies relevant issues of elaboration of assessment methodology for public-private partnership projects in Russia and worldwide. Efficiency assessment is still one of the most disputable topics in modern public-private partnership practice as the most popular approaches are contradictory and mutually exclusive. We consider the main aspects of efficiency assessment such as quantitative and qualitative methods, cost-benefit assessment and some issues of financial model analysis. These methods were approved in the final part by the example of the case study of the Russian PPP project “Western High-Speed Diameter” in Saint Petersburg. In conclusion we give recommendation for The Ministry of Economic Development of the Russian Federation. Krykanov D.D. (2017). Elaboration of a methodology for assessing the efficiency of public-private partnership projects - Russian and foreign experience [Problemy vyrabotki metodologii otsenki effektivnosti proektov gosudarstvenno-chastnogo partnerstva – rossiyskiy i zarubezhnyy opyt]. Public-Private Partnership, 4(3). (in Russian). – doi: 10.18334/ppp.4.3.38449. (0). .  . (in Russian). Source Journal of Money, Credit and Banking. 42 (6). 985-1010. Keyroz S. (0). Predvaritelnaya otsenka Proekta «Zapadnyy skorostnoy diametr» (ZSD) [Preliminary assessment of the Western High-Speed Diameter Project (WHSD)] Investments in Russian transport infrastructure . (in Russian). Author(s): American Journal of Political Science. 39 (3). 628-639.